Design Thinking- characteristics from a way of life we often have forgotten? How enlighting it was to discover that Design Thinking, a method and a mindset totally new to me, was in the end, at least to me, very similar process and way of thinking, as what it is to being just a human being at its most courageous ways. But for sure, it is not simple. Nor it is supposed to be. That would be boring. Human existence is about falling and getting up. From the day one we enter the word. It´s planned that we should learn something during this process so that when getting up we´d know what to do differently to avoid falling again for the same reason. This lifetime learning requires huge cognitive processing: thinking, “prototyping” and experimenting. In order to grow and get wiser within this process we also need other people around us reflecting ourselves (preferably with different backgrounds), as well as encouraging, safe, inspirational surroundings where to do this lifelong mental gymnastics. Surprisingly this all applies to rather many characteristics on what it is to be a Design Thinker conducting Design Thinking. Me, A Designer?- yep…for sure. When I first stepped into the Design Thinking- course (August 2015), held by lecturers Dr. Katja Tschimmel and Mariana Valenca, I had doubts that how I could at any point be considered as a Design Thinker, which I immediately assimilated with professional designers and artists. It soon become clear that Design Thinking is not about making us all designers, nor it is only a cognitive process, but it is an effective toolkit for any innovation process (Tschimmel, 2012). More over it is very human process which requires abilities we all have for sure, but which are so often overlooked (or forgotten) by more conventional ways! Tim Brown (2009) nails the very basic idea:”Design Thinking is a set of principles that can be applied by diverse people to a wide range of problems”. What a relief! -That does not sound bad at all. I can do that- right? How to do this, really? Oh dear! What to choose? Which tools to use? – Help! In the end, there is not single good one, all of them function (Tschimmel 2012). Each design process is a different and the Design Thinking process varies accordingly. What is similar is that the phases of divergence and convergence takes turns and that the process is not linear but takes loops of idea experimentation and the ever so important failing, until reaching in the end THE solution. What also is important in DT process besides assimilating the methods and courage to fail is to realize the importance of the other people. You need different backgrounded people to gain opposite thoughts and views to shake your mind to develop new ideas. Design Thinking is a team work! Design Thinking is also very visual way of working. As children learn the most by playing and doing themselves with their hands, same goes with adults. We just need encouraging and inspiring and safe environment to brainstorm and play (see picture 1: playing with Legos!). Design Thinker is a whole hearted, courageous explorationist, who goes beyond the apparent to find new solutions to different latent needs by using abductive future oriented thinking. Do I have all what it takes? I have my doubts, of course. But as an optimistic person I´d say, I will get there by failing and learning. Bigger question is that does the surrounding world, including organisations and businesses have what it takes? To open to their doors to Design Thinking which combines the standard analytics and rationality with feelings, intuition, and inspiration? 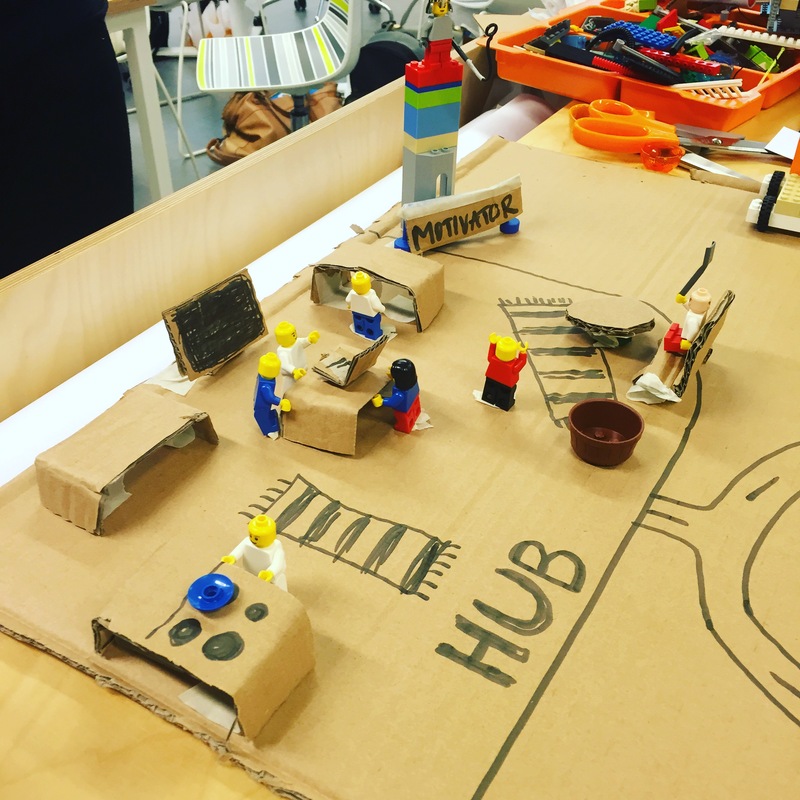 Written by Jenni Ståhl, Service Design and Innovation Mba student. I was inspired by your metaphor about human existence and DT as a method and mindset. We will master the ability to choose tools and methodologies according to the caracteristic of each innovation process and I am also optimistic about our capability to learn these innovative “ingredients” as you call them.